building in both is 718 St. Peter. each with a long and colorful history. on the property two doors down. Flechier family used it for their townhouse. city, famed nightspot, Pat O'Brien's. interior of Pat O'Brien's in the 1940's. banner of Spain waved over the old city. location of the St. Peter Street Theater at what is now 732 St. Peter Street. later sold his property to Don Esteban de Flechier). that the title of El Coliseo was given to the building located there at the time. and outlining a long list of do's and don'ts for visitors to the theater. After 1793, the playhouse went by the name of La Salle de Comedie for several years. an American city, under the name of La Theatre de la rue St. Pierre. In 1821, the property where the theater had been located was sold by Gen. J. B.
foundations of the old playhouse at that time. Currently, the building is home to Ali Baba, a popular Greek restaurant. 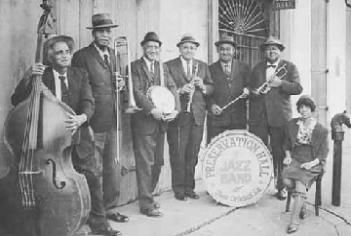 of Stanley Clisby Arthur's "Old New Orleans," published in 1936.